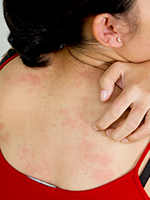 BACKGROUND: Psoriasis is a debilitating chronic inflammatory autoimmune disease affecting approximately 7.4 million adults in the United States. Plaque psoriasis is the most common form, affecting 80% to 90% of patients. OBJECTIVES: To describe the impact and challenges that psoriasis presents for various stakeholders, and to provide nondermatologist healthcare decision makers with information to enhance their contributions to drug and pharmacy benefit design discussions. DISCUSSION: Psoriasis carries an increased risk for early mortality and an increased prevalence of comorbidities, including psoriatic arthritis, cardiovascular disease, and diabetes. It is also associated with anxiety, depression, and social isolation, and can negatively impact patients’ relationships, productivity, and careers. The physical, psychologic, social, and economic impact of psoriasis, plus the associated stigma, result in cumulative impairment over a patient’s lifetime. The current treatments for moderate-to-severe psoriasis include topical therapy, phototherapy, and systemic drugs (nonbiologic and biologic); however, patient satisfaction remains low, combination therapy and treatment switching are common, and many patients remain untreated or undertreated. Clinicians should consider the patient holistically, and should select treatment based on a range of factors, including disease severity (with physical and psychosocial manifestations), susceptibility to cumulative life-course impairment (considering personality, behavior, and cognition), comorbidities, concomitant medication, and patient preference. It is estimated that the total annual direct cost of treating psoriasis in the United States in 2015 exceeded $12.2 billion. CONCLUSION: Psoriasis is a complex disease, and appropriate management is correspondingly complex. Newer psoriasis treatments provide improved efficacy and safety versus traditional treatments, but challenges remain in ensuring patients access to these medications. An improved understanding of the barriers to appropriate treatment is needed, as well as clear and accessible information for payers and clinicians on current treatment options, to ensure that decision makers can control costs while providing patients with optimal care. In light of the increasing prevalence and burden of psoriasis and the rapidly changing treatment landscape of the disease, the purpose of this article is to provide an overview of the key aspects of moderate-to-severe psoriasis, including the methods by which it is assessed, current treatment options, and unmet treatment needs. The impact of psoriasis on patients, clinicians, payers, and employers will also be discussed. In the clinical practice setting, formal measures are often not used, relying instead on subjective assessments, particularly patient satisfaction, to drive treatment decision-making. The paucity of objective clinical outcomes, and the major limitation of risk adjustment, are significant hurdles to assessing the quality of the management of patients with psoriasis in the clinical setting. Various options are available for the treatment of psoriasis, including topical agents, phototherapies and photochemotherapy, and systemic nonbiologic drugs, such as methotrexate (MTX) and cyclosporine (both immunosuppressive drugs), acitretin (a second-generation retinoid), and apremilast (an oral small-molecule inhibitor of phosphodiesterase-4), as noted in Table 1. In addition, several systemic biologic therapies are currently approved (as of March 2016) by the US Food and Drug Administration (FDA) for the treatment of chronic, moderate-to-severe plaque psoriasis, including inﬂiximab, etanercept, adalimumab, ustekinumab, secukinumab, and ixekizumab (Table 1). In a survey conducted in the United States, Canada, France, Germany, Italy, Spain, and the United Kingdom, dermatologists reported that among patients with moderate-to-severe psoriasis, approximately 75%, 20%, and 20% of patients were receiving topical therapy, conventional oral therapy, and biologics, respectively.15 The American Academy of Dermatology has developed algorithms identifying recommended treatment options for psoriasis,19 and several drugs are currently under investigation for the treatment of psoriasis. The efficacy of conventional systemic agents (ie, MTX and cyclosporine) and of biologic agents has been widely documented.13,20 A systematic review and meta-analysis of 48 randomized controlled trials of therapies approved for the treatment of moderate-to-severe psoriasis reported biologics to have higher efficacy than conventional systemic agents, with inﬂiximab having the highest efficacy, followed by adalimumab and ustekinumab.20 Newer agents (ie, secukinumab, ixekizumab, and apremilast) were not included in this systematic review, because it was conducted before their availability. Taken together, the potential for low satisfaction with psoriasis treatment, the rates of untreated and undertreated patients, frequent treatment switching, and the widespread use of combination therapy in the attempt to try to achieve a satisfactory response represent unmet treatment needs in patients with psoriasis of all severities. Treatment should reflect the severity of disease, as is recommended by current treatment guidelines19 rather than being initiated using a stepwise approach. Treatment decisions are often difficult for physicians, because many medical management policies require a step-edit approach as a condition for reimbursement, requiring that the patient’s disease fails to respond adequately to topical and/or conventional systemic therapies before being able to prescribe biologics.54 This may limit clinicians’ ability to aggressively treat patients with moderate-to-severe disease, despite the recommended treatment guidelines. As a consequence of the links between the cost of care, patient case mix, and the severity of disease, the inclusion of financial considerations in clinician performance ratings raises concerns among dermatologists that a dermatologist who manages patients with severe psoriasis could receive a lower rating than another clinician who only manages patients with mild psoriasis or who undertreats patients with moderate-to-severe psoriasis. Most biologic therapies, and some of the newer nonbiologic agents, are effective in multiple autoimmune (and nonautoimmune) diseases, but have different dosage regimens across indications, which can present a challenge to payers.66 Payer formulary strategy and utilization management for FDA-approved specialty drugs are frequently based on a collective therapeutic review for all indicated autoimmune diseases. Such reviews are often based on the autoimmune disease with the largest patient population, which is rheumatoid arthritis.66 This strategy may result in a formulary that may limit or even preclude access to some treatment options for patients with other conditions, such as moderate-to-severe psoriasis. Decision makers have to face difficult choices in sharing limited resources not just between competing treatments within a disease but between different disease states, and it is critical that all stakeholders have an informed understanding of this. The high incidence of undertreatment of moderate-to-severe psoriasis and the variability in patient response highlight that despite a large range of available treatments, there remains an unmet need for new and effective treatments, as well as improved access to existing treatments. Continued research is needed to develop effective treatments for psoriasis with acceptable safety profiles and convenient administration routes, as well as regimens that will address issues of low treatment satisfaction and poor adherence among patients. Action is also needed to ensure that US treatment guidelines allow decision makers to control costs while providing patients with optimal care, and that such guidelines are followed by providers. Recent advances have led to the discovery of new agents for the treatment of psoriasis, providing broader treatment choices than those available only a few years ago. Improved education of clinicians and payers in terms of the continually evolving nature of available treatments and their different mechanisms of action, efficacy, potential side effects, and position in treatment algorithms is needed to help inform treatment choices. Treatment plans should be developed in discussion with the patient to enhance adherence to their treatment regimens and to optimize patient outcomes. The writing and preparation of this article were funded by Pfizer, Inc.
Medical writing support, under direction from the authors, was provided by Carole Evans, PhD, of Complete Medical Communications. Dr Feldman has received research, speaking and/or consulting support from a variety of companies including AbbVie, Advance Medical, Suncare Research, Anacor, Astellas, Baxter, Boehringer Ingelheim, Janssen, Lilly, Merck, Merz, Mylan, Caremark, Celgene, Cosmederm, Galderma, GSK/Stiefel, Informa, Leo Pharma, National Biological Corporation, National Psoriasis Foundation, Novartis, Pfizer Inc, Qurient, UpToDate, and Valeant. He is founder and majority owner of www.DrScore.com, and founder and part-owner of Causa Research, a company dedicated to enhancing patients’ adherence to treatment. Dr Feldman has participated in advisory boards for AbbVie, Boehringer Ingelheim, Merck, Novartis, and Pfizer Inc; has served as a consultant for AbbVie, Amgen, Celgene, Galderma Laboratories, Lilly, Mylan, Novartis, and Pfizer Inc; and is a member of speakers’ bureau for Celgene, Galderma, and Janssen. Dr Feldman has received research grant support from Galderma Laboratories, Celgene, Novartis, and National Biological Corporation. Dr Gottlieb has current consulting or advisory board agreements with Abbott Labs (AbbVie), Actelion, Amgen Inc, Astellas, Akros, Baxalta, Beiersdorf, Inc, Bristol-Myers Squibb Co, Canfite, Catabasis, Celgene Corp, Centocor (Janssen), Coronado, CSL Behring Biotherapies for Life, Dermipsor Ltd, GlaxoSmithKline, Genentech, Incyte, Karyopharm, Kineta One, KPI Therapeutics, Lilly, Novartis, Meiji Seika Pharma Co, Ltd, Mitsubishi Tanabe Pharma Development America, Inc, Novo Nordisk, Pfizer Inc, Takeda, TEVA, UCB, Vertex, and Xenoport; and has received research/educational grants (paid to Tufts Medical Center) from Abbott (AbbVie), Amgen, Baxalta, Celgene, Centocor (Janssen), Dermira, Levia, Lilly, Merck, Novartis, Pfizer Inc, and Xenoport. Dr Goffe has research, speaking, and/or consulting support from AbbVie, Amgen, Astellas, Celgene, Centocor, Lilly, Novartis, and Pfizer Inc.
Mr Rice has participated in advisory boards for AbbVie, Biogen Idec, Janssen, Novartis, and Pfizer Inc; has served as a consultant for Gilead; and is a member of speakers’ bureau for Novartis. Dr Kaur, Ms Robertson, Dr Sierka, Dr Bourret, and Dr Evans are employees and shareholders of Pfizer Inc.
1. World Health Organization. Psoriasis. Agenda item 13.5. World Health Assembly; Geneva, Switzerland; May 24, 2014. http://apps.who.int/gb/ebwha/pdf_files/WHA67/A67_R9-en.pdf. Accessed August 24, 2016. 2. Lo Sicco K, Camisa C, Grandinetti L. Psoriasis. September 2013. www.clevelandclinicmeded.com/medicalpubs/diseasemanagement/dermatology/psoriasis-papulosquamous-skin-disease/#cesec2. Accessed August 24, 2016. 3. Pathirana D, Ormerod AD, Saiag P, et al. European S3-guidelines on the systemic treatment of psoriasis vulgaris. J Eur Acad Dermatol Venereol. 2009;23(suppl 2):1-70. Erratum in: J Eur Acad Dermatol Venereol. 2010;24:117-118. 4. Gelfand JM, Neimann AL, Shin DB, et al. Risk of myocardial infarction in patients with psoriasis. JAMA. 2006;296:1735-1741. 5. Cohen AD, Sherf M, Vidavsky L, et al. 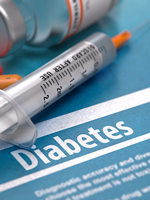 Association between psoriasis and the metabolic syndrome: a cross-sectional study. Dermatology. 2008;216:152-155. 6. Mehta NN, Azfar RS, Shin DB, et al. Patients with severe psoriasis are at increased risk of cardiovascular mortality: cohort study using the General Practice Research Database. Eur Heart J. 2010;31:1000-1006. 7. Gelfand JM, Troxel AB, Lewis JD, et al. The risk of mortality in patients with psoriasis: results from a population-based study. Arch Dermatol. 2007;143:1493-1499. 8. Svedbom A, Dalén J, Mamolo C, et al. Increased cause-specific mortality in patients with mild and severe psoriasis: a population-based Swedish register study. Acta Derm Venereol. 2015;95:809-815. 9. National Psoriasis Foundation. Psoriatic arthritis. www.psoriasis.org/psoriatic-arthritis. Accessed August 24, 2016. 10. Queiro R, Tejón P, Alonso S, Coto P. Age at disease onset: a key factor for understanding psoriatic disease. Rheumatology (Oxford). 2014;53:1178-1185. 11. Rachakonda TD, Schupp CW, Armstrong AW. Psoriasis prevalence among adults in the United States. J Am Acad Dermatol. 2014;70:512-516. 12. Parisi R, Symmons DP, Griffiths CE, Ashcroft DM; for the Identification and Management of Psoriasis and Associated Comorbidity (IMPACT) Project Team. Global epidemiology of psoriasis: a systematic review of incidence and prevalence. J Invest Dermatol. 2013;133:377-385. 13. Menter A, Gottlieb A, Feldman SR, et al. Guidelines of care for the management of psoriasis and psoriatic arthritis: section 1. Overview of psoriasis and guidelines of care for the treatment of psoriasis with biologics. J Am Acad Dermatol. 2008;58:826-850. 14. Armstrong AW, Robertson AD, Wu J, et al. Undertreatment, treatment trends, and treatment dissatisfaction among patients with psoriasis and psoriatic arthritis in the United States: findings from the National Psoriasis Foundation surveys, 2003-2011. JAMA Dermatol. 2013;149:1180-1185. Errata in: JAMA Dermatol. 2014;150:103; JAMA Dermatol. 2014;150:337. 15. van de Kerkhof PC, Reich K, Kavanaugh A, et al. Physician perspectives in the management of psoriasis and psoriatic arthritis: results from the population-based Multinational Assessment of Psoriasis and Psoriatic Arthritis survey. J Eur Acad Dermatol Venereol. 2015;29:2002-2010. 16. Garber C, Plotnikova N, Au SC, et al. Biologic and conventional systemic therapies show similar safety and efficacy in elderly and adult patients with moderate to severe psoriasis. J Drugs Dermatol. 2015;14:846-852. 17. Feldman SR, Koo JY, Menter A, Bagel J. Decision points for the initiation of systemic treatment for psoriasis. J Am Acad Dermatol. 2005;53:101-107. 18. Kitchen H, Cordingley L, Young H, et al. Patient-reported outcome measures in psoriasis: the good, the bad and the missing! Br J Dermatol. 2015;172:1210-1221. 19. Menter A, Korman NJ, Elmets CA, et al; for the American Academy of Dermatology Work Group. Guidelines of care for the management of psoriasis and psoriatic arthritis: section 6. Guidelines of care for the treatment of psoriasis and psoriatic arthritis: case-based presentations and evidence-based conclusions. J Am Acad Dermatol. 2011;65:137-174. 20. Schmitt J, Rosumeck S, Thomaschewski G, et al. Efficacy and safety of systemic treatments for moderate-to-severe psoriasis: meta-analysis of randomized controlled trials. Br J Dermatol. 2014;170:274-303. 21. Mansouri Y, Goldenberg G. Biologic safety in psoriasis: review of long-term safety data. J Clin Aesthet Dermatol. 2015;8:30-42. 22. National Psoriasis Foundation. Drug pipeline. http://services.psoriasis.org/drug-pipeline/index.php. Accessed August 24, 2016. 23. Armstrong AW, Koning JW, Rowse S, et al. Under-treatment of patients with moderate to severe psoriasis in the United States: a study of medication usage with health-plan data. Poster presented at the National Psoriasis Foundation Research Symposium and National Volunteer Conference; July 24-26, 2015; San Francisco, CA. 24. Feldman SR, Zhao Y, Navaratnam P, et al. Patterns of medication utilization and costs associated with the use of etanercept, adalimumab, and ustekin­umab in the management of moderate-to-severe psoriasis. J Manag Care Spec Pharm. 2015;21:201-209. 25. Cather JC, Crowley JJ. Use of biologic agents in combination with other therapies for the treatment of psoriasis. Am J Clin Dermatol. 2014;15:467-478. 26. Richards HL, Fortune DG, Griffiths CE. Adherence to treatment in patients with psoriasis. J Eur Acad Dermatol Venereol. 2006;20:370-379. 27. Callis Duffin K, Yeung H, Takeshita J, et al. Patient satisfaction with treatments for moderate-to-severe plaque psoriasis in clinical practice. Br J Dermatol. 2014;170:672-680. 28. Finch T, Shim TN, Roberts L, Johnson O. Treatment satisfaction among patients with moderate-to-severe psoriasis. J Clin Aesthet Dermatol. 2015;8:26-30. 29. Schaarschmidt ML, Kromer C, Herr R, et al. Treatment satisfaction of patients with psoriasis. Acta Derm Venereol. 2015;95:572-578. 30. Menter A, Korman NJ, Elmets CA, et al. Guidelines of care for the management of psoriasis and psoriatic arthritis: section 5. 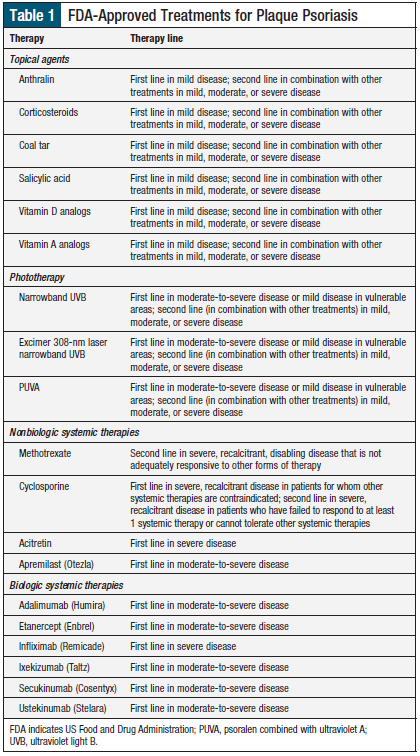 Guidelines of care for the treatment of psoriasis with phototherapy and photochemotherapy. J Am Acad Dermatol. 2010;62:114-135. 31. Zhang M, Brenneman SK, Carter CT, et al. Patient-reported treatment satisfaction and choice of dosing frequency with biologic treatment for moderate to severe plaque psoriasis. Patient Prefer Adherence. 2015;9:777-784. 32. Blome C, Simianer S, Purwins S, et al. Time needed for treatment is the major predictor of quality of life in psoriasis. Dermatology. 2010;221:154-159. 33. Lebwohl MG, Bachelez H, Barker J, et al. Patient perspectives in the management of psoriasis: results from the population-based Multinational Assessment of Psoriasis and Psoriatic Arthritis Survey. J Am Acad Dermatol. 2014;70:871-881.e30. 34. Schaarschmidt ML, Schmieder A, Umar N, et al. Patient preferences for psoriasis treatments: process characteristics can outweigh outcome attributes. Arch Dermatol. 2011;147:1285-1294. 35. Dowlatshahi EA, Wakkee M, Arends LR, Nijsten T. The prevalence and odds of depressive symptoms and clinical depression in psoriasis patients: a systematic review and meta-analysis. J Invest Dermatol. 2014;134:1542-1551. 36. Bewley A, Burrage DM, Ersser SJ, et al. Identifying individual psychosocial and adherence support needs in patients with psoriasis: a multinational two-stage qualitative and quantitative study. J Eur Acad Dermatol Venereol. 2014;28:763-770. 37. Kurd SK, Troxel AB, Crits-Christoph P, Gelfand JM. The risk of depression, anxiety, and suicidality in patients with psoriasis: a population-based cohort study. Arch Dermatol. 2010;146:891-895. 38. Paul C, Bushmakin AG, Cappelleri JC, et al. Do patients and physicians agree in their assessment of the severity of psoriasis? Insights from tofacitinib phase 3 clinical trials. J Dermatol Clin Res. 2015;3:1048. 39. Møller AH, Erntoft S, Vinding GR, Jemec GB. A systematic literature review to compare quality of life in psoriasis with other chronic diseases using EQ-5D-derived utility values. Patient Relat Outcome Meas. 2015;6:167-177. 40. de Korte J, Sprangers MA, Mombers FM, Bos JD. Quality of life in patients with psoriasis: a systematic literature review. J Investig Dermatol Symp Proc. 2004;9:140-147. 41. Rapp SR, Feldman SR, Exum ML, et al. Psoriasis causes as much disability as other major medical diseases. J Am Acad Dermatol. 1999;41(3 pt 1):401-407. 42. Lewis V, Finlay AY. 10 years experience of the Dermatology Life Quality Index (DLQI). J Investig Dermatol Symp Proc. 2004;9:169-180. 43. Ryan C, Sadlier M, De Vol E, et al. Genital psoriasis is associated with significant impairment in quality of life and sexual functioning. J Am Acad Dermatol. 2015;72:978-983. 44. Chung J, Callis Duffin K, Takeshita J, et al. Palmoplantar psoriasis is associated with greater impairment of health-related quality of life compared with moderate to severe plaque psoriasis. J Am Acad Dermatol. 2014;71:623-632. 45. Stern RS, Nijsten T, Feldman SR, et al. Psoriasis is common, carries a substantial burden even when not extensive, and is associated with widespread treatment dissatisfaction. J Investig Dermatol Symp Proc. 2004;9:136-139. 46. Ayala F, Sampogna F, Romano GV, et al; for the Daniele Study Group. The impact of psoriasis on work-related problems: a multicenter cross-sectional survey. J Eur Acad Dermatol Venereol. 2014;28:1623-1632. 47. Horn EJ, Fox KM, Patel V, et al. Association of patient-reported psoriasis severity with income and employment. J Am Acad Dermatol. 2007;57:963-971. 48. Schmitt J, Küster D. Correlation between Dermatology Life Quality Index (DLQI) scores and Work Limitations Questionnaire (WLQ) allows the calculation of percent work productivity loss in patients with psoriasis. Arch Dermatol Res. 2015;307:451-453. 49. Schaefer CP, Cappelleri JC, Cheng R, et al. Health care resource use, productivity, and costs among patients with moderate to severe plaque psoriasis in the United States. J Am Acad Dermatol. 2015;73:585-593.e3. 50. Kimball AB, Gieler U, Linder D, et al. Psoriasis: is the impairment to a patient’s life cumulative? J Eur Acad Dermatol Venereol. 2010;24:989-1004. 51. Warren RB, Kleyn CE, Gulliver WP. Cumulative life course impairment in psoriasis: patient perception of disease-related impairment throughout the life course. Br J Dermatol. 2011;164(suppl 1):1-14. 52. Feldman SR. Treatment of psoriasis. UpToDate. www.uptodate.com/contents/treatment-of-psoriasis#H2. Accessed August 24, 2016. 53. Wilson SR, Strub P, Buist AS, et al; for the Better Outcomes of Asthma Treatment (BOAT) Study Group. Shared treatment decision making improves adherence and outcomes in poorly controlled asthma. Am J Respir Crit Care Med. 2010;181:566-577. 54. 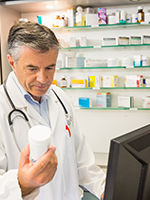 Stern D. Benefit design innovations to manage specialty pharmaceuticals. J Manag Care Pharm. 2008;14(4 suppl A):S12-S16. 55. Menter A, Griffiths CE. Current and future management of psoriasis. Lancet. 2007;370:272-284. 56. Balkrishnan R, Bhosle MJ, Fleischer AB Jr, Feldman SR. Prior authorization for topical psoriasis treatments: is it cost-beneficial for managed care? J Dermatolog Treat. 2010;21:178-184. 57. Freedman JD, Gottlieb AB, Lizzul PF. Physician performance measurement: tiered networks and dermatology (an opportunity and a challenge). J Am Acad Dermatol. 2011;64:1164-1169. 58. American Academy of Dermatology. President-Elect calls on members to come together. Dermatology World Meeting News. March 21, 2014. www.aadmeetingnews.org/2014-annual-meeting-daily/president-elect-calls-on-members-to-come-together/. Accessed August 24, 2016. 59. Owens GM. Revolutionizing treatment outcomes in hepatitis C: managed care implications and considerations—the new and evolving standards of care. Am J Manag Care. 2015;21(5 suppl):S97-S105. 60. Vanderpuye-Orgle J, Zhao Y, Lu J, et al. Evaluating the economic burden of psoriasis in the United States. J Am Acad Dermatol. 2015;72:961-967.e5. 61. Brezinski EA, Dhillon JS, Armstrong AW. Economic burden of psoriasis in the United States: a systematic review. JAMA Dermatol. 2015;151:651-658. 62. Howe A, Eyck LT, Dufour R, et al. Treatment patterns and annual drug costs of biologic therapies across indications from the Humana commercial database. J Manag Care Spec Pharm. 2014;20:1236-1244. 63. D’Souza LS, Payette MJ. Estimated cost efficacy of systemic treatments that are approved by the US Food and Drug Administration for the treatment of moderate to severe psoriasis. J Am Acad Dermatol. 2015;72:589-598. 64. Mustonen A, Mattila K, Leino M, et al. How much of the productivity losses among psoriasis patients are due to psoriasis. BMC Health Serv Res. 2015;15:87. 65. Hagland M. Step therapy and biologics: no easy answers. Biotechnol Healthc. 2006;3:32-40. 66. Cohen M, Morrow T, Penna P. Managing the expanded use of biologics across therapeutic areas: an example from B-cell targeted therapies. Am J Manag Care. 2006;12(2 suppl):S24-S37, quiz S38. 67. Express Scripts. Express Scripts 2015 Drug Trend Report. March 2016. http://lab.express-scripts.com/lab/drug-trend-report. Accessed August 24, 2016. 68. CVS Health. Taking aim at trend. Insights. Spring 2015. www.cvshealth.com/sites/default/files/INSIGHTS_Trend_2015.pdf. Accessed August 24, 2016. PAYERS: Payers have long recognized that psoriasis is a chronic inflammatory disease that affects a significant portion of the US population. 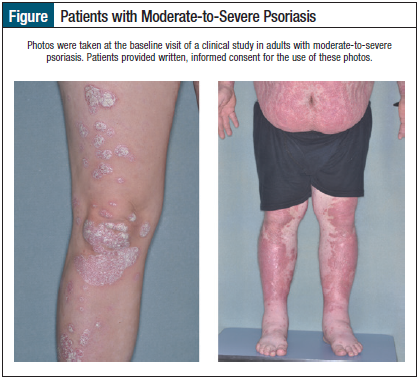 The most common form is plaque psoriasis, which affects approximately 2% (ie, 7 million patients) of the population.1 According to Feldman and colleagues, approximately 20% of these patients may have moderate-to-severe disease and are therefore potential candidates for systemic therapies.2,3 Payers also recognize the unmet needs for this patient population. There is no cure for this disease, and many patients are burdened with complex and difficult-to-use topical therapies. In the past 2 decades, systemic biologic therapies began to offer patients new and sometimes remarkably effective treatments for this condition. There are currently 6 approved systemic biologic treatments for psoriasis. The mainstay continues to be anti–tumor necrosis factors; however, newer agents that target inter­leukins are now also available. While reading the current article,2 I was particularly struck by the figure of $30,568—the calculated annual healthcare cost per patient between 2007 and 2012 for biologic therapies for patients with moderate-to-severe psoriasis.2 If we agree that 7 million patients have psoriasis, and that 20% have moderate-to-severe disease, then potentially 1.4 million patients are candidates for biologic therapy. If only 50% of those patients were treated with biologics, at a cost of $30,568, the bill would then be an astonishing $21.4 billion, assuming that costs have not risen since this study. This is only 1 example of the staggering fiscal reality that payers deal with on a daily basis while trying to maintain access and affordability for members and their employer customers. PROVIDERS, PATIENTS: Feldman and colleagues balance perspectives from the patient, the payer, and the physician.2 Patients want better and more affordable treatments; physicians struggle with the burden of payer management; such as prior authorizations and clinical management programs; and payers must find ways to continue to pay for these often-revolutionary treatments. However, we all must deal with the continuing reality of cost. As noted, the cost potential of treating even one disease, such as psoriasis, could become unsustainable. Payers are left with blunt instruments (eg, prior authorizations, step-therapy, and contracting for best price) to help control costs. Payers recognize the administrative burdens that these approaches create, but these are necessary in today’s environment. The challenge will be to bring payers, drug developers, physicians, and patients together to come up with potentially more innovative ways to manage the growing costs. We may need to develop new reimbursement methods, share risk with providers and patients, and find innovative ways to match the best treatment for each patient at the right cost. In the meantime, payers will continue to use the current approaches, while eagerly seeking alternative models in search of new ways to pay for advances in therapy. 1. Langley RG, Krueger GG, Griffiths CE. Psoriasis: epidemiology, clinical features, and quality of life. Ann Rheum Dis. 2005;64(suppl 2):ii18-ii23; discussion ii24-ii25. 2. Feldman SR, Goffe B, Rice G, et al. The challenge of managing psoriasis: unmet medical needs and stakeholder perspectives. Am Health Drug Benefits. 2016;9(9):504-513. 3. Menter A, Gottlieb A, Feldman SR, et al. Guidelines of care for the management of psoriasis and psoriatic arthritis: section 1. Overview of psoriasis and guidelines of care for the treatment of psoriasis with biologics. J Am Acad Dermatol. 2008;58:826-850. 4. QuintilesIMS. 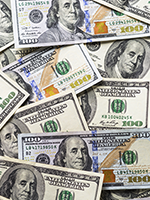 IMS Health study: U.S. drug spending growth reaches 8.5 percent in 2015. Press release. April 14, 2016. www.imshealth.com/en/about-us/news/ims-health-study-us-drug-spending-growth-reaches-8.5-percent-in-2015. Accessed December 11, 2016.